Until recently, what worried consumers most was the salt content of cured ham. WHO (World Health Organisation) recommends consuming a maximum of 5g per day (even less in children and adolescents) to reduce the risk of cardiovascular disease, although the world average of between 9 and 12g is more than double. These days it seems that other additives used by most manufacturers generate more fear or distrust in consumers: preservatives, antioxidants, acidity regulators … This article will try to explain why they are used and what the associated health risks are. Salt is the oldest known preservative and without it meat would rot. It’s also a flavour enhancer: we tend to find that ham with less than 2.5% salt is tasteless and with an unpleasant texture. Pata negra ham (jamón ibérico) has the least salt content of them all (between 2.5% to 4.5%). It’s followed by Serrano ham (5%), Bayonne ham (5.5%) and Parma ham (5.7%). Credit goes to genetics in this case: the marbling fat and higher pH level in Iberico hams hinders the penetration of the salt. When compared with other types of products, it would be at the same level as Roquefort cheese or olives. As we mentioned in the introduction, it’s been proven that excess salt increases the risk of cardiovascular disease (hypertension, heart attacks, etc.) but it’s also thought to cause kidney failure and osteoporosis. The most commonly used preservatives are potassium nitrate (E-250) and sodium nitrite (E-252). Nitrates and nitrites have been used for hundreds of years and play an important role in ensuring the microbiological safety (especially protecting consumers from botulism) of foodstuffs. The European Food Safety Agency limits the maximum amount of sodium nitrite to 100mg/kg and potassium nitrate to 150mg/kg (Directive 2006/52 /EC). It is such a low amount that the formation of potentially carcinogenic nitrosamines is negligible. Furthermore, jamón isn’t a product that has to be cooked, so that the high temperatures needed to display said compound (130ºC) wouldn’t be reached. In this sense a much more dangerous meat would be, for example, bacon, as it is a product with a short maturation period and cooked at high temperatures (150-190°C). These two compounds, in addition to protect us from certain bacteria, also influence the colour and aroma. The meat becomes slightly redder and the smell of curing overpowers any rancid aromas. Almost all producers use one, or both, of these preservatives with some exceptions being Joselito hams and the organic hams (also known as ecological ). This commitment to the elimination of additives requires them to exercise extreme control of the curing process, especially during the first 3 months, which is when there is more risk of microbiological contamination. On the other hand, these pieces tend to have a longer maturation period of between six months to a year. The more dehydrated the ham, the harder it is for bacteria to grow. The effect on the colour is not essential in the case of Iberian ham, as the high content of zinc in this type of meat is the main guarantor of its reddish coloration, and so it doesn’t need the coloration effects of the preservatives. However, in Italy they have eliminated all additives in Parma ham and San Daniele for quite some time now (except salt, of course). And in Switzerland the use of sodium nitrite (E-252) is not allowed under any circumstances. Sodium ascorbate (E-301) is often added to reduce the adverse effects caused by preservatives, as it reduces the generation of nitrosamines. It’s considered harmless, but consuming more than 10mg per day can cause diarrhoea and kidney stones. Sodium citrate (E-331-iii) is completely harmless and there are no set daily limits on how much is safe to ingest. It serves to regulate the pH (acidity) and to strengthen the role of antioxidants. Although often used in sausages, it’s rarely used in ham and serves to mask the bitter, stale notes. In short, the most harmful additive used in ham is salt. If we were to share an 80g serving with one other person, we will have ingested between 1 and 2g of salt, which is between 20% and 40% of the recommended daily amount, more or less the same as if we were to eat 125g of bread (half a baguette, for example). What can I say? I would rather stop eating bread and eat a whole tapa of Pata Negra ham. 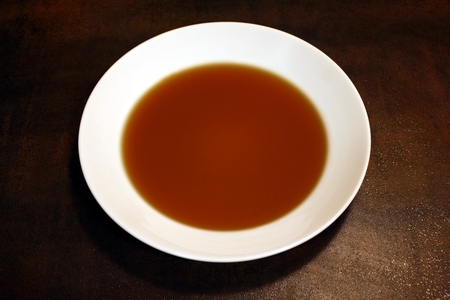 Your pata negra ham may have nothing left to give but you can still do things with it, like making a delicious consommé or a flavorful sauce for a meat dish. The bone marrow and the bits of meat you can’t cut off the bone are tasty and nutritious (vitamins, minerals, essential fatty acids and more). Here is how to get it all with very little work and money. Optional: a little parsley, 2 bay leaves, a piece of turnip, half a cabbage, one pig’s foot and 500 grams of beef, lamb or chicken. DO NOT ADD SALT. 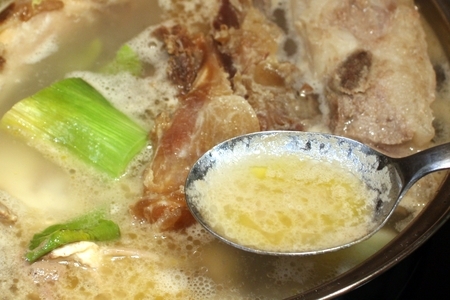 The bone contains some salt and it is best to wait until the broth is done before salting to taste. The ham has several bones and it is best to locate the joints and cut the ligaments with a kitchen knife (photo 1). The biggest pieces can be cut with a saw or a cleaver. 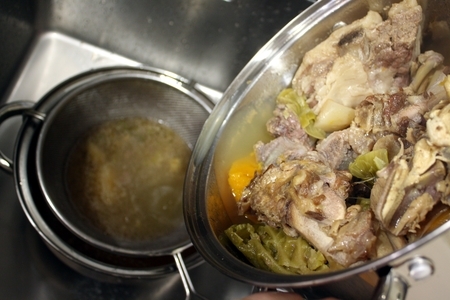 Remove the skin from the pieces and leave a small amount of rancid fat (photo 2). Cut up the vegetables (photo 3), place everything in a pot with cold water and cook over high heat until it comes to a boil. Then simmer over low heat for 2 to 4 hours (photo 4). The longer you leave it, the stronger it will be. Skim off any scum that forms (photo 5) every 60 minutes to reduce calories. Finally, strain the broth (photo 6) and leave it to cool a few hours. When it is at room temperature, put it in the refrigerator. After about 2-3 hours remove it and skim off the fat layer that will have formed on the surface (photo 7) to give a smoother broth that is easier to digest. Strain it again with a strainer, or with a thin cloth (photo 8) if you like it very clear. 1. Cut the ligaments to separate the ham bones. 2. 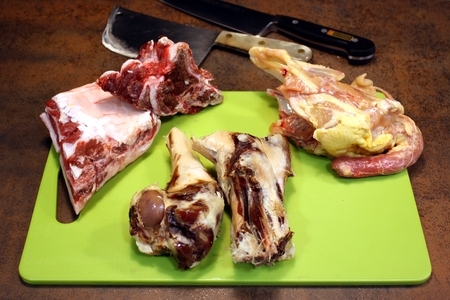 From left to right: beef bone and ribs, ham bones and chicken carcass. 4. All the ingredients in the pot. 5. Skim off the scum every hour. 6. 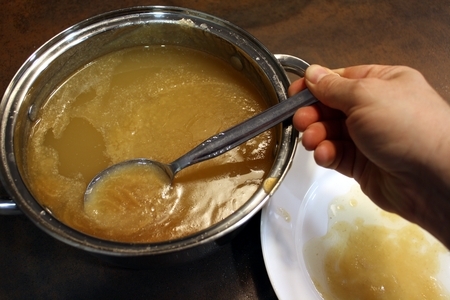 Strain the broth and let it cool to make it easier to remove the fat. 7. Remove the fat that has risen to the surface. 8. 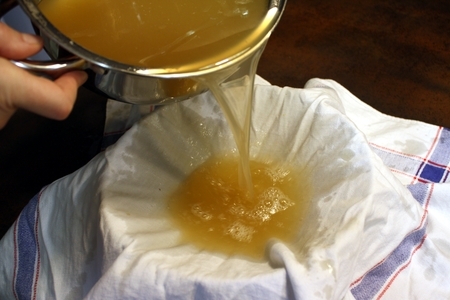 Strain the broth with a thin cloth to make a very clear soup. 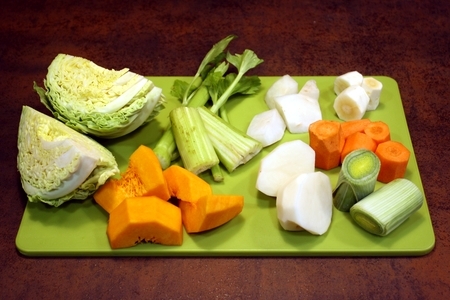 If you want a broth with more body, blend it with a beater for 2 minutes. If you want less fat, add a beaten egg white to the broth about 15 minutes before removing it from the heat. Add a handful of chickpeas, pasta or rice together with the bones and vegetables to get a smoother texture. Prepare exactly the same as the consommé but cook the ingredients (except the wine) in the oven before boiling. This will give a darker color and a slightly roasted flavor. 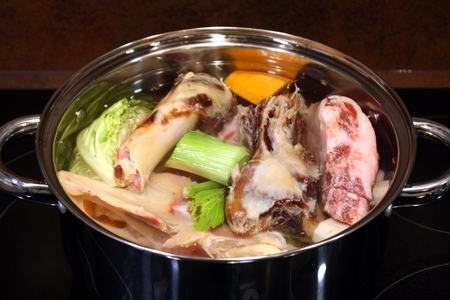 Place the cut bones in the oven at 180ºC and add the vegetables after 30 minutes. Remove the pan after another 15 minutes and place everything in a pot with cold water and wine. It is unusual for a customer to explain why they buy jamón de bellota. We mostly assume it is simply because Pata Negra is great. But there are several customers who have told us that they buy ham because of how little they feel hungry and it helps them to boost their appetite. For most of us gluttony is a problem, but there are some who need to stimulate their appetite because their lack of appetite causes them important nutritional deficiencies. Some medical treatments, such as chemotherapy to cure cancer, cause nausea and lack of appetite. Also stress, the deficit of some minerals and various digestive disorders are associated with reluctance. There seems that there are even some people with a sense of permanent satiety that makes them hate food. The first thing recommended to stimulate the appetite is to eat what you like. That is, what you most enjoy. If you have a medical prescription to avoid fatty products, remove the fat and eat only lean. Pure Iberian ham (Pata Negra), such as Cinco Jotas Ham from Jabugo, is usually fattier than ham from mixed breed pigs, but the difference is minimal. However, the level of healthy oleic acid tends to be higher than what is found in mixed breed. Our recommendation: pure bred. In most of our homes, jamón de bellota, is eaten only during large celebrations: dinners on Christmas Eve and New Year’s Eve, weddings, christenings, communions… The memory of these good moments enjoying a ham in the best company opens up our appetite. Unlike other foods, such as cheese or seafood, the smell of ham is very subtle. Strong odours can sometimes cause rejection, and therefore are not recommended in these cases. So, it is best consumed unheated at room temperature so as to prevent the smell getting stronger. Serrano ham, if it has had a minimum maturation period of 18 months, also has pleasant and toasty aromas. But if the curing period is anything less than 12 months it still smells a little like fresh meat and is not so appetizing. Fibre, present above all in vegetables (1.5% in lettuce) and cereals (2.2% in brown rice), is essential for a balanced diet but is very filling (it produces gases) and can be difficult to digest. This mineral is necessary, among other things, to regulate digestion and prevent loss of appetite. It is mainly found in protein-rich foods such as pork, and some seafood. Poor appetite coupled with lack of time leads to some people skipping breakfast, lunch or dinner. With ham there are no excuses: you open the fridge, take out a packet with already sliced ham inside. It’s also great for snacking, allowing you to distribute food intake and reduce the size of main meals (some people can’t manage a full plate). There are other natural remedies that help to ignite your appetite, such as mint infusions, anise or liquorice. There are also medicines and drugs, like those derived from cannabis (marijuana and hashish) which act directly on brain receptors that trigger appetite. But it’s clear that, as delicious as Iberico jamón de bellota is, nothing has been invented so far. Why doesn’t a good Pata Negra ham taste salty? 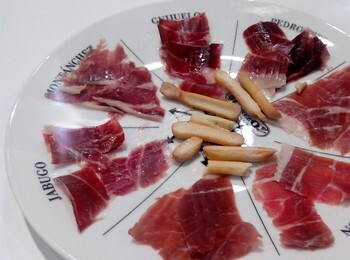 If you are asked which is saltier, a slice of Iberian jamón de bellota or a crisp? The answer will almost always be the crisp. Moreover, if I ask you to first try a sample of each, the answer wouldn’t change. The reality is very different: a bag of crisps typically contains 1.5g of salt per 100g of potatoes, while Pata Negra ham contains between 3 to 4.5g per 100g. Even the Serrano ham, which usually doesn’t even reach 5% salt content, seems significantly saltier than Bellota ham despite it having only slightly more salt. Another example: seawater has a salinity of about 3.5%, but it seems much saltier than jamón . The marbling fat and protein deserve credit in this case. 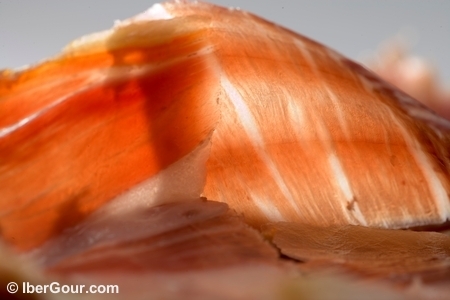 As everyone knows, Iberian ham has a lot of fat marbling, which means the white streaks in the slice. If it’s also Bellota, the fat will melt in the mouth and inundate our taste buds. Thus, our taste buds will be concentrated on the fat and stop being so sensitive to the salt (the sodium of the salt, to be exact). 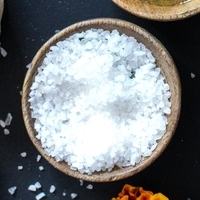 On the other hand, during the 3 or 4-year maturation period of a good Pata Negra, the salt combines with meat protein, reducing its impact on the taste buds. Whereas Jamón de bellota seems sweet, it actually doesn’t have much less salt than Serrano ham. You should always follow the recommendations of experts not to consume cured ham more than 2 or 3 times a week, the equivalent to between 100 and 150g, and thus will not reach 15% of the recommended daily allowance (RDA) by WHO (World Health Organisation). We can raise this amount if we moderate our consumption of salt in other foods such as salads and soups, for example. Worth the sacrifice, right? Author M. Nieto GallardoPosted on October 25, 2016 February 28, 2018 Categories Facts about pata negra ham, Nutrition and healthLeave a comment on Why doesn’t a good Pata Negra ham taste salty? What does Reserva mean when talking about ham? Is Bellota ham produced outside of the Iberian peninsula? Several times a year (for example, Christmastime or for our anniversary), we launch very short-lived (normally 1-3 days) discount offers on our hams. Subscribe to our newsletter, and we will let you know when there is an offer.